Slough’s second game of the weekend saw them make a trip to Wiltshire to face the Swindon Wildcats. Mindy Kieras and Andrej Vasiljevic returned to the Slough side for this game and the teams spent the opening minutes of the game feeling for their opponent’s weaknesses. With 18.41 played Aaron Nell opened the scoring finishing from Jonas Hoog and Lee Richardson and 1.19 later the first period ended 1-0. The second period saw 26 combined shots on goal but with two of the league’s top netminders on duty such a high shooting period only produced one goal which was the game leveller from Mindy Kieras, unassisted at 36.16 and the second period then duly ended with just a single goal having been scored and the game evenly poised at 1-1. 190 seconds into the final period Swindon’s second goal came from Sam Bullas, securing a powerplay goal. At 47.53 with the home team enjoying the man advantage again Jan Kostal scored the game winning goal from Pekkarinen and Sandvik on the powerplay. Slough ensured the end of the game would be tense with Ryan Webb pulling the margin back to a single goal at 54.38 but the home team closed out for the win. 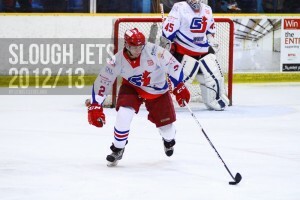 Slough Jets lined up against Guildford Flames for their third and final league meeting of the season at the Hangar. Rick Plant opened the scoring at 9.35, giving Guildford a lead they wouldn’t lose, then Paul Dixon doubled the lead with 29 seconds left in the opening period scoring a powerplay goal with Frantisek Bakrlik sitting out a high sticking minor. All through the middle period the teams traded powerplay opportunities as the game became more and more physical but despite 14 combined shots on goal there was no further scoring in the second period. Slough put spark back into the game just 36 seconds into the final period when Michael Wales slotted an unassisted slapshot past Mark Lee for 1-2 but 54 seconds later David Longstaff scored for Guildford to restore the two goal margin. 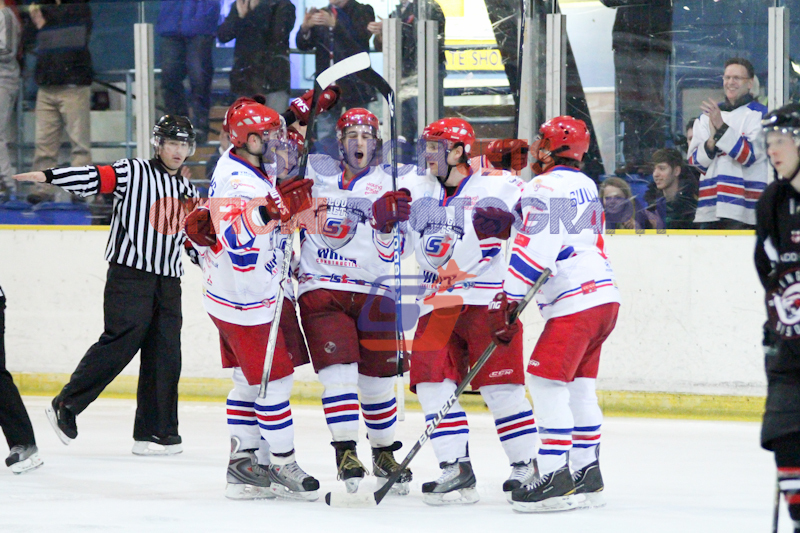 Longstaff scored a powerplay goal at 46.05 and Dean Holland scored 16 seconds later for 1-5. Slough took their time-out immediately after the 5th Guildford goal but it was at 58.40 that they found the back of the net for their second of the night, scored by Darius Pliskauskas. Guildford however closed out the final 80 seconds to hold on for a 2-5 win. 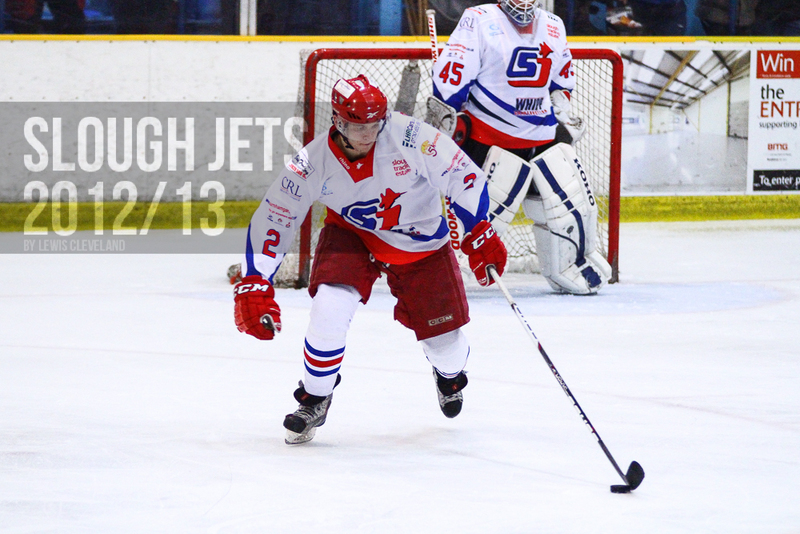 Slough Jets made the journey to Telford to face the Tigers. Slough killed off the game’s first penalty but back at full strength Telford’s Scott McKenzie netted the game’s first goal at 10.48. The teams then traded powerplays and Slough ended the period penalty killing. Nathan Salem doubled up the home team lead at 27.32 but Adam Calder pulled a goal back on the powerplay for the visitors at 32.48. Telford’s two goal lead was restored by Daniel Croft at 34.25 and the home team held their lead to the interval. Slough pressed hard to get themselves back into the game in the third period. Doug Sheppard knocked home a delayed penalty goal at 42.20 but Ashley Calvert restored Telford’s margin at 50.55. Darius Pliskauskas made it 4-3 at 56.30 but Telford managed to hold on for the final 3.30 and take the win. After the journey down the A33 Slough faced-off against Basingstoke 22 minutes late as the second half of the home and away weekend. Slough dominated the scoring opportunities in the first period but great displays from both netminders kept the game scoreless after the first 20 minutes. The visitors again enjoyed the shots advantage through the middle period but at 30.50 Ondrej Lauko put the home team ahead in a so far penalty free game. Steve Moria doubled up their lead at 37.19 before Tom Long took the game’s first penalty. Slough started the third period with 54 seconds of powerplay remaining and the home team weren’t long at full strength before Mindageus Keiras took a delay of game penalty. Ollie Bronniman picked up an abuse of official penalty in the final 10 minutes at 52.53 prompting Peter Russell to take his team’s shut-out. Fortunes didn’t change and while Annetts kept a clean sheet in the home net Nicky Chinn scored with 1.01 left to make it 3-0.